Tanzanian model, Hamisa Mobetto´s relationship moves have seen her tagged ´A Husband Snatcher´ but she denies it all. According to the video vixen, she has been severally spotted with one, Tahiya´s man, Alex, whom she was not aware were actually an item. 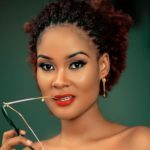 Hamisa Mobetto and Alex, previously Hamisa Mobetto exclusively reveals that Alex, also Tahiya´s lover might have been the one who lied to her about his current relationship status. The songbird articulates that she was not aware that Alex, who she was dating, was also playing her with another woman, Tahiya. Hamisa Mobetto explains: When I met that man, we started going out on dates and he never told me he had another woman. He only told me he had a baby mama whom they split and that they hadn´t spoken since December last year. Unfortunately, while Hamisa and ´her man´ were out on vacation in Zanzibar, Alex´s lover, Tahiya was present and gave them a run for their time. A battle of words between the 3 took the day at Zanzibar. Hamisa however cites that she has broken bonds with Alex and categorically states, she is no husband-snatcher! The post Hamisa Mobetto responds to ´husband-snatcher´ allegations appeared first on Ghafla! Kenya.